Home Features How Are Aldi and Lidl Related? How Are Aldi and Lidl Related? In 2017, a little store named Lidl opened its doors in the United States for the first time. (In case you’re wondering, it’s pronounced LEE-duhl, as you can see in this Lidl-produced video.) Lidl has been around in different parts of Europe for a long time, but the planting of stores along the East Coast was its first venture across the Atlantic Ocean. The grocer has plans to expand westward into the United States. Lidl is a German-owned small-inventory grocery store, which naturally draws comparisons to Aldi, another German-owned small-inventory grocery store. So are the stores related, and, if so, how? 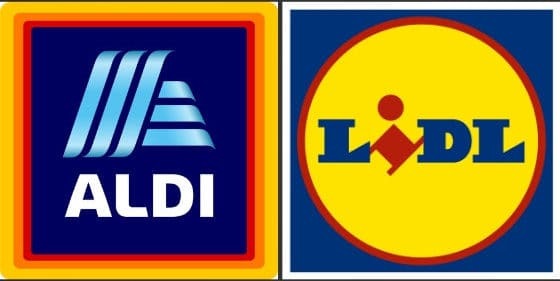 First off, we should make one thing clear: Lidl and Aldi are not related, at least not in any corporate sense. Their ownership groups are completely separate and, while they do have some techniques in common, they are competitors. To use an American analogy, they are like Sam’s Club and Costco: two companies that use a similar method to doing business but are out to outsell one another. The families that own Lidl and Aldi (keep in mind that Aldi is technically two companies) are completely separate from one another. Lidl’s orgins trace to a German named Josef Schwarz, who got into the grocery business back in the 1930s. Unlike Aldi’s Albrecht brothers, who were retail grocers almost from the beginning, Schwarz was involved in a number of businesses related to the larger food industry, including wholesale fruit. In the 1970s, however, Schwarz began to focus in on supermarket retail. For linguistic reasons, Schwarz did not want to name the store after himself (Schwarz means “black” and possible names would sound too much like “black market”) so he settled on the name Lidl, inspired by the name of a business partner. Schwarz decided to borrow the small-inventory concept that Aldi and some other German grocers were using, including the use of both permanent and rotating inventory items. Josef Schwarz died in 1977, and his son, Dieter, took over, leading the company as it expanded outside of Germany and into Western and Eastern Europe. In large part because of Lidl, Dieter is currently worth over $20 billion. But there are also some significant differences. Lidl doesn’t use quarters for grocery carts, for example. Lidl also has free samples, a color-coded wine rating system, and some other bells and whistles that will look different to long-time Aldi shoppers. Lidl also takes coupons; Aldi does not. And Lidl seems to find itself in a lot more controversy than Aldi has been, from Lidl’s business practices to the way it treats employees. It remains to be seen if Lidl can be a real competitor to Aldi in the United States. Time will tell. One thing, though, is certain: while the two companies do some things similarly, there is no love between the two, and we fully expect that competition to be fierce in the U.S. just as much as it has been in Europe.